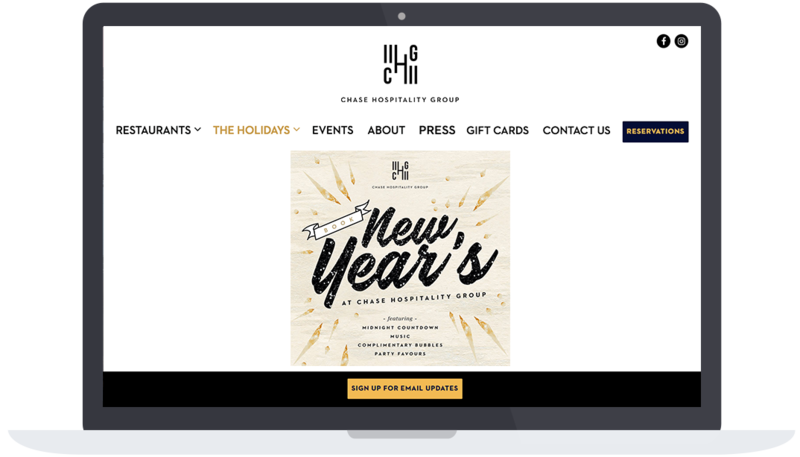 The holiday season is prime time for restaurants to capitalize on private events, catering and e-commerce opportunities, and online promotions are a great way to help your seasonal offerings stand out in the crowd. We’ve gathered a few of our favorites to provide some inspiration as you map out your own for the festive times ahead. Amali in Manhattan looks beyond evening-only parties when they are promoting their private events during the holidays. 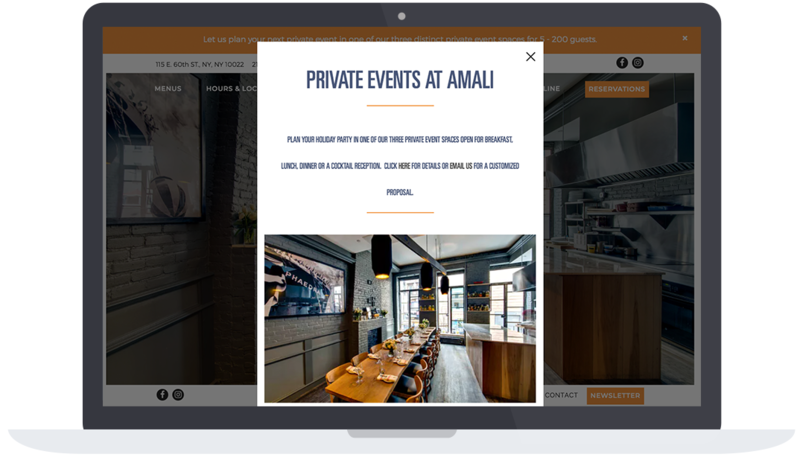 By using a homepage alert on their website, this Mediterranean-focused eatery lets guest know first thing that they offer bookings throughout the entire day-- perfect for low-key holiday office parties and more. They go the extra mile by featuring photos of their various event spaces in the notification, and include links directly to their events page, making it even easier for guests to inquire about private bookings. 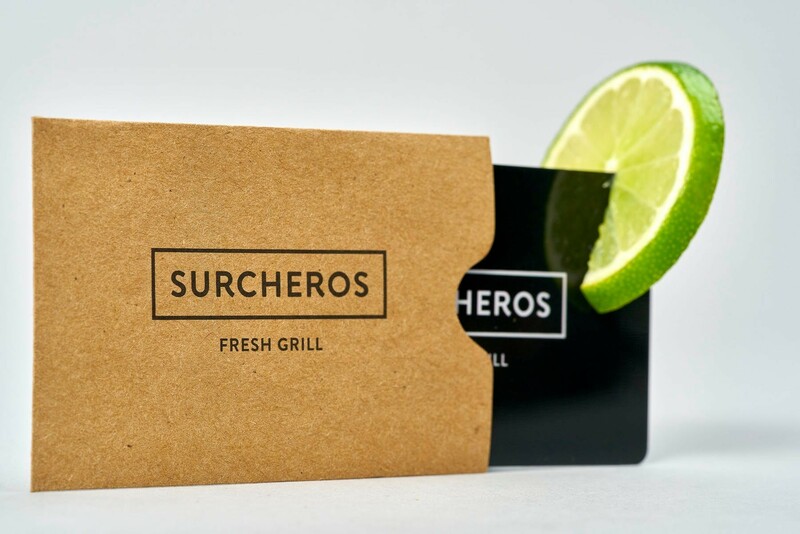 Surcheros collects email subscribers directly from their website. With that list, this Tex-Mex restaurant in Georgia is able to reach out to a captive audience for gift card promotions during the holidays. This year they’ve sent an email campaign with a special deal to incentivise sales: Buy $100 in gift cards and get an extra $20 for free. And since they offer physical and digital gift card sales directly on their website, guests can buy them at any time, no matter how busy their holiday schedule gets. In D.C., Bresca has established itself as an inventive and modern take on the classic bistro. So it’s no wonder that they’re offering guests a chic soiree to ring in the New Year. 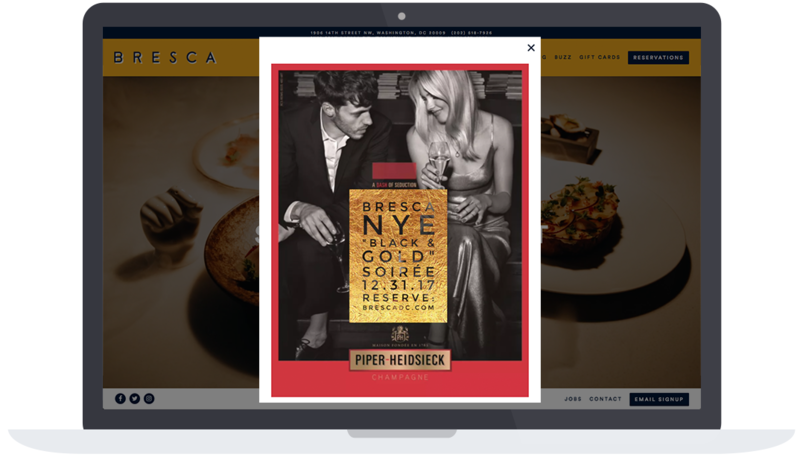 But rather than go it alone, Bresca has teamed up with Piper-Heidsieck Champagne to put together a partnered event that promises to be both festive and whimsical. This website promotion shows the power of partnerships. Teaming up with organizations that align with your restaurant’s brand helps set your event apart, while also attracting new guests with similar interests. Chase Hospitality Group in Toronto is home to seven different restaurants. 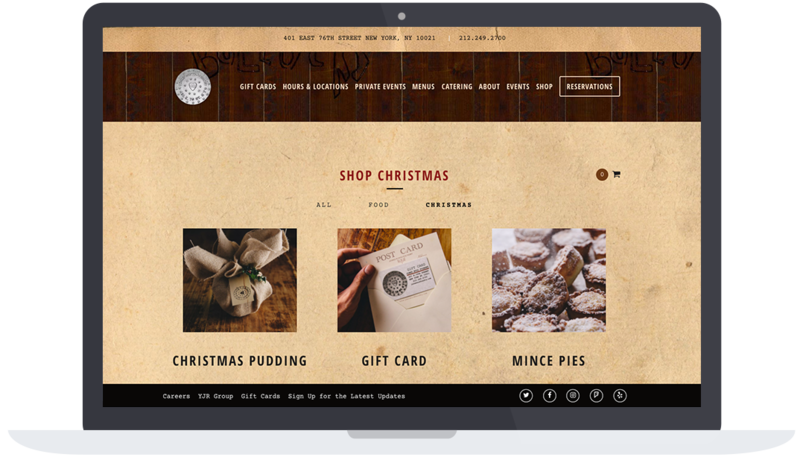 To highlight festive events across all their eateries, they’ve incorporated a “Holidays” tab on their website navigation bar. With the tab prominently displayed, guests can quickly see information about holiday hours and New Year’s Eve party promotions. With all their options in one place, it's easy for guests to plan their seasonal outings accordingly. When it come to online store offerings, Jones Wood Foundry thinks beyond the typical holiday gift options. This New York-based neighborhood pub taps into its British roots by showcasing items like Christmas pudding and mince pies as tasty gift options for their guests. The restaurant promotes their seasonal offerings on a special “Christmas” section in their online store, with gorgeous photos to boot. For many restaurants, opening hours and days can fluctuate during the holiday season. 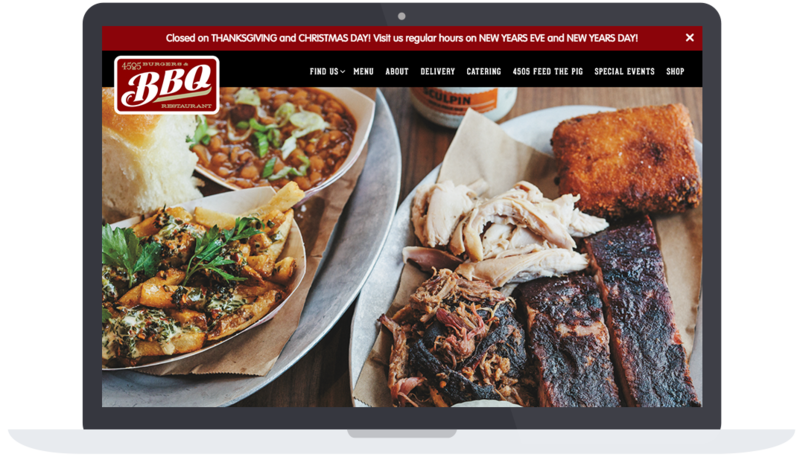 4505 Burgers & BBQ has multiple locations in California, but by using a website banner on their homepage, they easily communicate that they’ll be closed for Thanksgiving and Christmas. The banner works because it fits with the aesthetic of their website, while still effectively sharing important holiday information with guests.